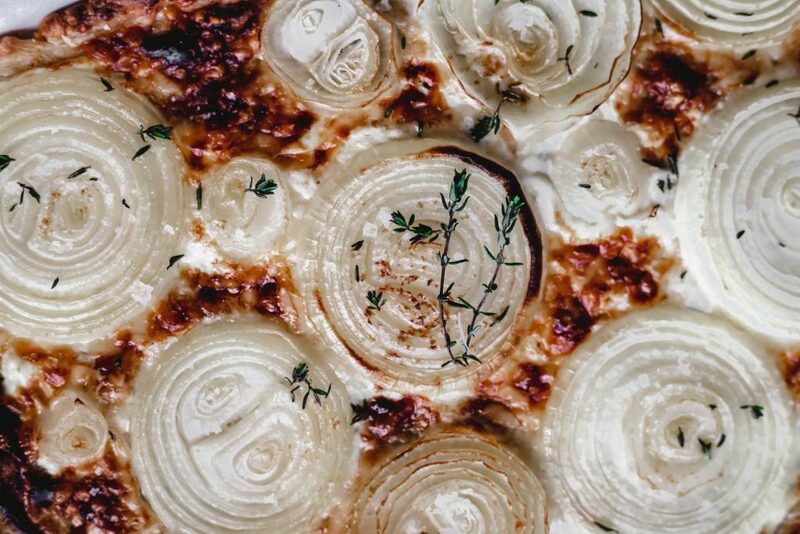 Beautiful tart with simple onions as the main ingredient. Sometimes I struggle to find just the right dish for a brunch or appetizer for a party. How many hummus platters can I truly make? You know? This time of year I really, really start to miss summer, especially summer produce. Fresh plucked tomatoes from my garden are by far the BEST, taking a bite and tasting pure summer. I got thinking about tomato tart, one of my favorite things to do with those fresh summer tomatoes, like this one I have on the blog. I wanted to create a riff on that classic but something warm and comforting for these cold winter days. 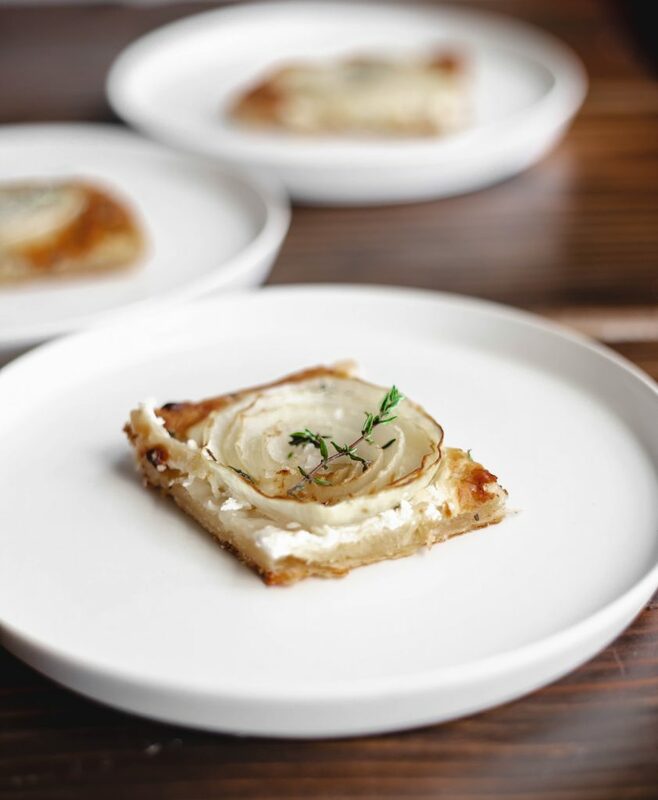 Onion tart! Classic enough to make all year long but especially good when you’re craving comfort food. 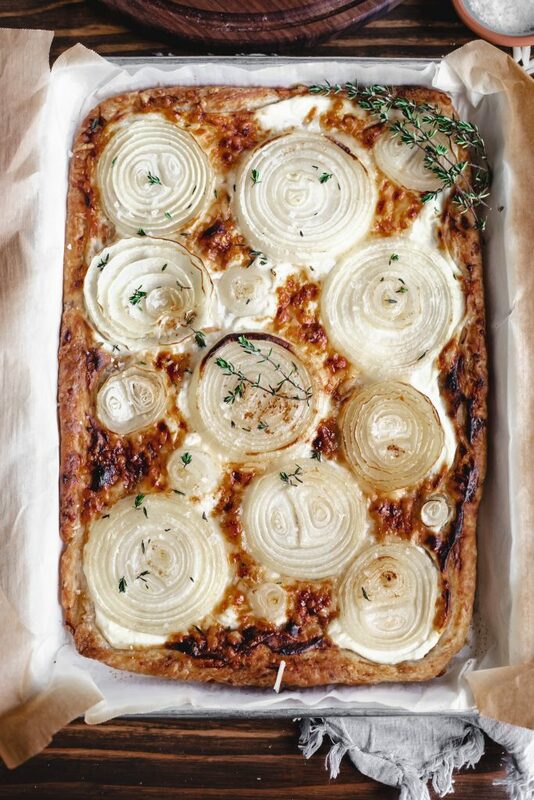 This onion tart would be delightful for brunch or cut up into small pieces and used as an appetizer dish. Who says your Superbowl party can’t have these fancy appetizers? A few sprigs of fresh time and sprinkle of pure flake sea salt really elevate the dish. 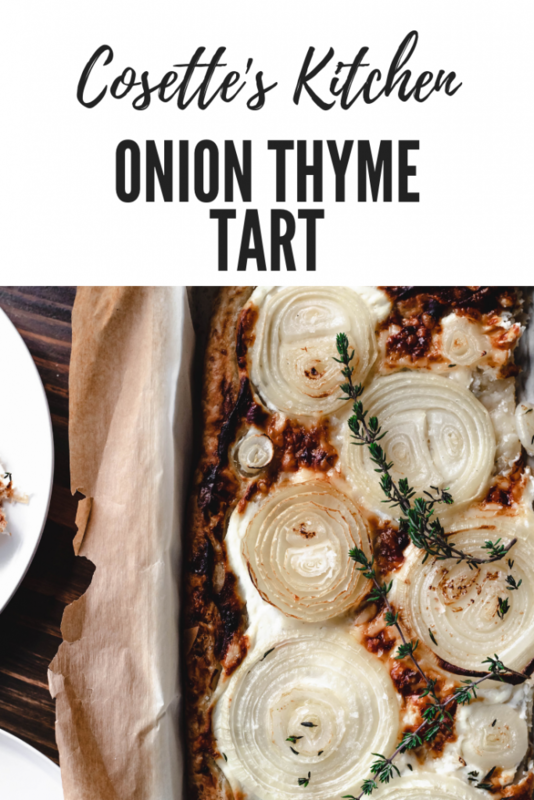 The balance of a buttery crust, cheese, labneh and sweet onions really gives this tart soooooo much depth of flavor. A bit of sweetness from the onions, salty sharpness from the cheese, tanginess from the labneh and pure heaven from the buttery crust. If you don’t have labneh, you can easily substitute with thick Greek yogurt or ricotta cheese, both would be a good substitute. I love making my own pie dough, it’s simple ingredients but you can certainly use prepared pie dough. I would definitely work in the cheese and thyme in the dough to give it that extra something special. Perfect for a brunch gathering. I truly hope you try this delicious and simple recipe. As always, I love seeing your creations, tag me on Instagram or Facebook!! Don’t forget to Pin the recipe! 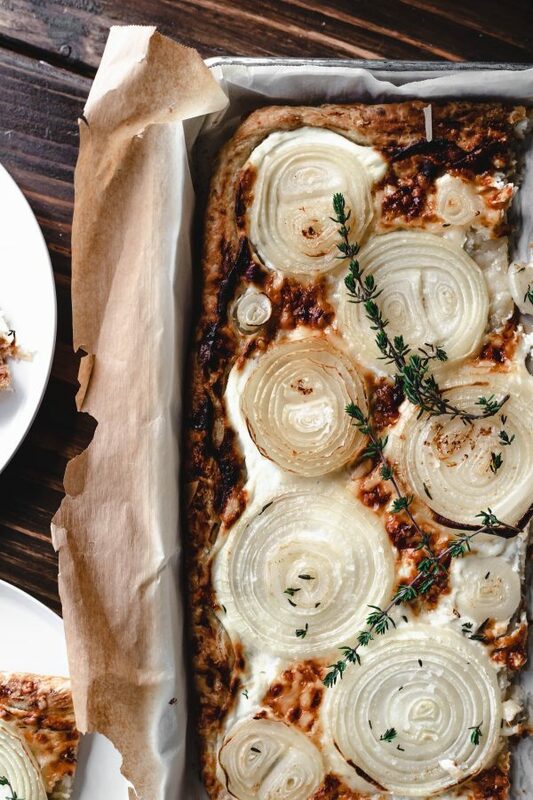 This onion tart is a crowd pleaser! I strongly encourage you to make your own pie dough but if you are unable to, please refer to notes below. In the bowl of a food processor, add in your flour, sugar, salt and pulse for a few seconds to combine. Next, add in your cubed butter one slice at a time. Pulse, release then add another. Add in your cheese and thyme. Next add in one tablespoon of water at a time until a crumbly but cohesive dough forms. Usually 6-7 tablespoons. On a sheet of wax or parchment paper, dump your dough mixture out. Press using the sides of the paper to create a disc. The dough should come together, wrap and place in fridge for at least an hour but can be made ahead and pulled out the next day. Remove your dough from the fridge and on a floured surface begin rolling out into about a 9x12 rectangle (rustic is fine). In a quarter sheet pan (you can use a half sheet pan if you don't have a 9x12, just section to one side of the pan). Spray or butter and then place a piece of parchment paper. Lay your pie dough on the parchment, you can press the edges up slightly to create a small raised crust. Mix together your labneh, toum and salt. Spread an even thin layer on the crust. Next, sprinkle your Parmesan cheese. Slice your onions about 1/4" thick, I actually like cutting them with the skin on then peel off for each ring. Finally, place your sliced onion rings on top to cover most of the tart. I like to use a variety of different sizes. Dot your onions with some small pieces of butter and bake for 25 minutes until golden brown. You can broil the top for a few seconds at the end for a little more char on your onions if you'd like. Remove from oven and sprinkle with flake sea salt and additional thyme. Enjoy warm or at room temperature. Awwww, I’m so happy to hear this Ingrid! Darn toum, yeah if it was sprouting probably not the best for it. Yesssss, the yogurt from the IP is perfect. Let me know how you like it.